An impact linebacker at the high school level, Cory Redding was the recruit that all the colleges wanted. In the end he became the linchpin to Mack Brown‘s 1999 recruiting class at the University of Texas. He’d earn a mountain of accolades, including Big 12 rookie of the year, posting 26 tackles, 2 sacks, and 13 special teams stops. As each year progressed with the Longhorns, the awards and watch lists for Cory increased. 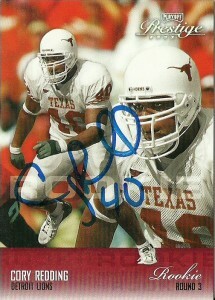 In 2000, he was honorable mention All-Big 12, with 52 tackles, 17 TFL, and 6.5 sacks, starting at defensive end. In 2001, Cory was tabbed for 2nd Team All- American and first team Big 12 with 57 tackles, 5 sacks and 14 TFL. The 2002 season was the culmination of it all, when he was the first Texas Lombardi finalist since Tony DeGrate. He finished the season as 1st Team All-American with 76 tackles, 8.5 sacks and 24 TFL. 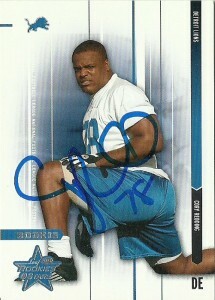 Surprisingly, C-Red was not drafted until the 3rd round of the 2003 Draft by the Detroit Lions. He didn’t get into the starting lineup until the following season. Redding strung together 66 consecutive starts from defensive end, and then later kicked inside to tackle for the Lions. 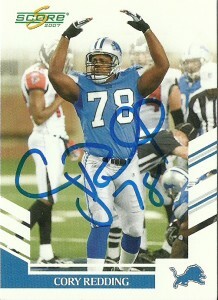 His best season came in 2006, when Cory recorded 39 tackles, 2 forced fumbles, and 8 sacks. He was rewarded with a generous contract by the Lions who made him team captain and the highest paid defensive tackle in the league.By 2008 injuries ended C-Red’s streak, as groin and knee injuries placed him on injured reserve in December of that season. Needing to free up some cap space and fix their team, the Lions traded Cory to the Seattle Seahawks in 2009 in exchange for LB Julian Peterson and a 5th round pick. Starting 3 games that season, Redding had 2 sacks, 18 tackles, and 2 FF. Left unprotected, he’d sign with the Baltimore Ravens and have some memorable situations showing up at the right time in big games, starting 22 games over the next two seasons and recording 7.5 sacks and 60 tackles. After the 2011 season, (much to my chagrin,) he’d play his final season for the Indianapolis Colts. I had gotten word on the radio of Cory’s new shop opening up in Austin off of 1300 the Zone. I then checked out his Twitter feed to confirm and then ordered the cards I needed since I hadn’t been able to find any the last time I visited the card shop. He apparently comes from a family that loves to cut hair, and he grew up around that environment, so going into the clipping business seems like quite a natural fit for the former defensive tackle. C-Red’s shop handles all the old fashioned trimmings and cuts, but also does the warm towel treatments and flat razor shaves- something I enjoyed immensely. Cory was really nice and engaging with fans. It did start off slowly, but as the 5 O’clock hour approached, things seemed to be extremely happening. I could tell he was very excited about the whole thing. He was more than happy to sign a few cards and take a photo with me. When I asked him why he didn’t respond to my twitter question, he told me that “He doesn’t talk to people who wear masks.” He and I then shared a laugh about it since in my profile picture I do have a mask on. There were a few Longhorns who showed up including Rod Babers, Rodrique Wright, and Mark Henry “The Strongest Man in the World”. I briefly had a stare down with Mark- and quickly lost. 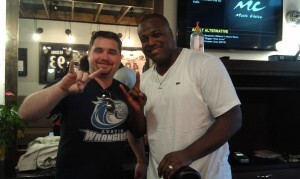 I later saw Cory again at the Austin Longhorn Youth Foundation’s Bowling tournament the next day. He smiled and told me I was looking dapper with my new haircut. All in all a very good experience meeting Cory and well worth taking the small amount of time off from work to see him open his shop. You can visit his barber shop’s web portal at: http://www.reddshaircutz.com. Chaun Thompson played linebacker at West Texas A&M in Canyon, Tx (South of Amarillo) and is from the same school that CFL great Alondra Johnson went to. 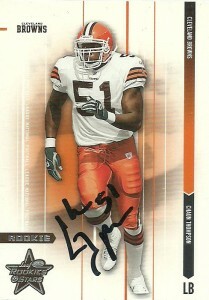 A second round pick of the Browns in 2003, Thompson would not start any games his rookie season. 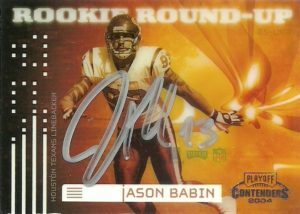 In 2004 he’d play at left linebacker, making 2.5 sacks, 3 pass defensed, 1 fumble recovery and 44 tackles. Chaun would follow this up in 2005 with a move to right outside linebacker. He’d start 15 games, making 5 sacks, 2 ff, and a career high 63 tackles. 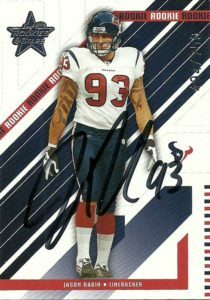 His 2006 and 2007 would be a regression, and in 2008 Thompson was allowed to leave via free agency to the Houston Texans where he made 1 sack in 2008. Injuries ended his 2009 and 2010 seasons before they really even took off. He currently is a free agent.